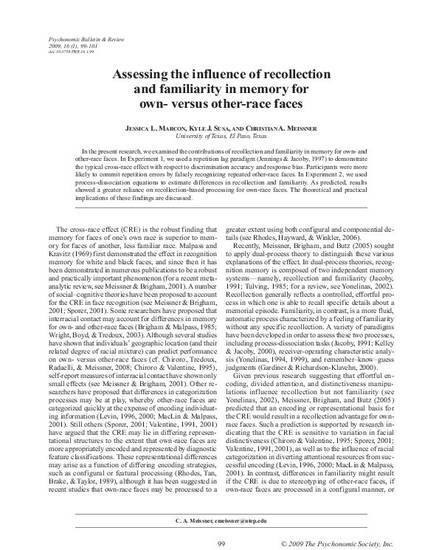 The current research examined the contributions of recollection vs. familiarity in memory for own- and other-race faces. Experiment 1 used a repetition lag paradigm (Jennings & Jacoby, 1997) to demonstrate the typical cross-race effect with respect to discrimination accuracy and response bias. Participants were also more likely to commit the ‘repetition error’ by falsely recognizing repeated other-race faces. Experiment 2 used process-dissociation equations to estimate differences in recollection and familiarity. As predicted, results showed a greater reliance on recollection-based processing for own-race faces. The theoretical and practical implications of these finding are discussed.